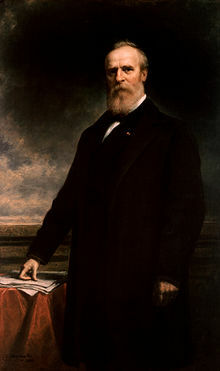 Rutherford Birchard Hayes (4. října 1822, Delaware, Ohio – 17. ledna 1893, Fremont, Ohio) byl 19. prezident Spojených států amerických. Many, if not most of our Indian wars have had their origins in broken promises and acts of injustice upon our part. ↑ FAST, Howard. Pochod Cheyennů. 1. vyd. [s.l.] : Madagaskar, 1996. ISBN 80-902044-5-7. ↑ HODGE, Carl Cavanagh. US Presidents and Foreign Policy. [s.l.] : ABC-CLIO, 2007. ISBN 9781851097906. S. 153.